DEBORAH CROMBIE: Just to make certain no one has post-Valentine's Day blues, here's a little pick me up for your Sunday morning. I think I promised recently to share my French toast recipe, and this seemed like the perfect time. And no thinking about either of the evil "C" words--calories or carbs--for another day! I first ran across this recipe--or something similar, since the original clipping has long since disappeared--in a copy of Gourmet Magazine. It must have been in the 80s or early 90s, when Laurie Colwin was still with us and writing her regular column. I never missed an issue in those days. About 5 slices of good grainy bread, cut in half. The bread can be a little stale. It will hold up better in the batter, and it's a great way to use up a good loaf. Lay the half slices out evenly in a dish. I use a Pyrex 9 x 13 baking dish. In another bowl (I use a big jug) beat five eggs with a fork until foamy. Add a cup of milk, half a cup of cream or half-and-half (if you must, but it's better with cream, and remember, we are not COUNTING) and half a cup of fresh orange juice. Then, put in a big splash--at least a couple of tablespoons, of really good orange liqueur. You can use Gran Marnier. I prefer one called Creole Shrubb, which is a little less sweet and has a bit of spiciness to it. Mix the ingredients well and pour over the bread slices. Let sit for a few minutes so that the bread can soak up the batter, and make sure all the slices are well covered. Meanwhile, heat a couple of tablespoons of olive oil and a couple of tablespoons of good unsalted butter in a large non-stick skillet. When the oil/butter mixture is foaming, add as many bread slices as the skillet will hold. Brown on one side, turn, and brown the other. Have a warmed plate ready for the first batch as you will need to do a second, adding a little more oil and butter as needed. Add the second batch of golden toast to the warmed plate. Turn down the heat under the skillet and toss in a couple of handfuls of fresh, washed blueberries (or more.) Cook gently, stirring, until the blueberries begin to break down and release their juice. Pour the hot blueberries over the toast. Serve with warmed real maple syrup. Crisp bacon makes this an absolutely scrumptious feast. This is my idea of the perfect Sunday brunch, served with a big pot of tea and the Sunday paper. REDs and readers, what's yours?? Oh, yum . . . I can't wait to try this. Thanks for the recipe! A perfect brunch? I think it depends on my mood. Eggs Benedict are one of my favorites; another is a recipe from an older edition of The Joy of Cooking for cornmeal waffles with bacon cooked right into the waffle. Served with maple syrup, it's wonderfully good. A pot of coffee made from freshly-ground coffee beans is a must. It's snowing here, and colder than cold . . . 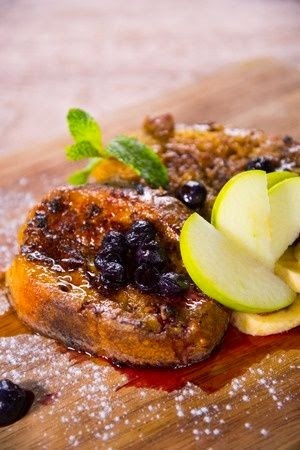 I may have to make oven French toast [with cream cheese and blueberries] just to warm things up . . . .
My favorite Sunday brunch is anything with blueberries. I have the blueberries, the Grand Marnier, and the evil bacon. Sounds great, Debs. Oh, yum! I might add a dollop of plain or vanilla yogurt on top of the French toast. I had a California Eggs Benedict in Hollywood a couple of years ago that featured, naturally, sliced avocado. I plan to test that recipe soon so I can include it in a Country Store mystery. I think Canadian bacon is a great brunch addition, as are mimosas. We're blizzarded in the morning, so brunch might be just the ticket. Thanks, Debs! My fave brunch item is Eggs Florentine.... Hot coffee. Maybe a nice half of a grapefruit.... Where are my minions to fetch me this? OH, MINIONS! oh my oh my oh my - this sounds heavenly, Debs, Thank You! Perfect brunch here is a huge skillet full of eggs scrambled with sauteed onions and mushrooms and lots (and lots) of cheese. Bacon, toast and fresh fruit. Or, if we go out I will always opt for Eggs Benedict. Breakfast and brunch dishes are my fave and I love having them for dinner too. Hope everyone is safe and warm!!! My favorite is homemade waffles with maple syrup, bacon, coffee, oj. But since my OLD old old waffle iron that weighed a million pounds died, it's just not the same. New waffle irons don't crisp the waffles properly and they stick. Give me good old heavy metal any day. I am actually not having French toast this morning, but eggs Benedict. I didn't have the right bread for the French toast, but I did have a couple of leftover English muffins. I'm doing blender Hollandaise--will let everyone know how it turns out! Wow, Joan. My mother used to make waffles with the bacon strips cooked in them! I hadn't heard of anyone else doing that. Yours is so pretty -- I had French toast and bacon this morning, perfect food for a cozy day indoors while the snow blows around. Sometime I will try adding the liquor! Oh, this all sounds so very yummy! let's see, breakfast… That can be answered in one word. Bacon. I really love egg whites, with bacon. And if I am so very lucky, wheat toast. No, pumpernickel! I also love toasted everything bagel with cream cheese and smoked salmon and capers and tomatoes and crazy salt! The crazy salt, as Roberta will knows, is essential. Happy Valentines weekend from the unbelievably snowy Boston. On waffle irons: It takes about 20 years for a carbon layer to build up and make a waffle iron/sandwich grill perfect. Old ones are very easy to rewire. But if you have a new waffle iron, because maybe your grandmother left hers to your aunt instead of your mother, you can speed up the process with repeated seasoning and frequent use. I did one very quickly by removing the plates and seasoning them in the oven in a higher-than-recommended heat. If you got teflon you can still do it if you don't mind serving toxic waffles and grilled cheese to the children. Heavy sigh! I wish I'd seen this before I wolfed down that big old breakfast burrito this morning! Maybe next Sunday..
Libby, there's something really special about the things our moms made for us, isn't there? Serve hot with maple syrup. Wow! You sure know how to do Sunday breakfast, Debs! My husband usually makes the French toast, and now I'm thinking it's been way too long since he's done so. Thanks for a great recipe. And all the other yummy breakfast ideas here are ones I need to jot down.